Take a whole lot of happiness, mix it up with some humour, add a lug of fun, a spoonful of sleep dreprevation, a case of wine, a splash of vodka & red bull, some pretty frocks, great food, perfect weather, and awesome company. Shake it all up (or just stand still long enough in Christchurch and it will shake itself up) and you pretty much get my last few weeks. Rachael and Dean's wedding day FINALLY arrived on Friday, March 11. I had flown up to Auckland on the Tuesday beforehand and stayed with Mum and Dad for one night. An added bonus was that they had picked up Kathryn on the way to the airport so I got to see her as well. AND I got to tease Moos when we dropped Kathryn home. He loves it. Really. Kristine and I caught the 'Naked Bus' (which, ironically, they prefer you to wear clothes on, FYI) from Warkworth up to Kamo, Whangarei on Wednesday morning. Cheap as chips too if you're ever thinking of bussing around New Zealand. So we got 2 hours of uninterrupted catch up time WITHOUT having to concentrate on driving. Brilliant. Kristine and her husband, Derek, are expecting a baby in August so we had lots to discuss about 'our' baby. Oh yes, Derek is very aware I am the second Mummy and doesn't seem to mind. What a good bloke. The few days before the wedding were full of dress fittings, meeting people, rehearsals, drinking, eating, manicures, pedicures, laughing and very little sleep. And then it was Friday. The BIG day. The weather was perfect. 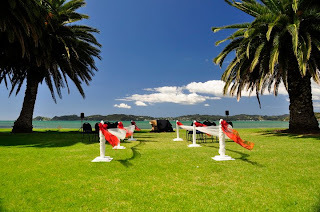 The setting for the outdoor ceremony was at the Copthorne Hotel in Waitangi on the grassy area by the waters edge. 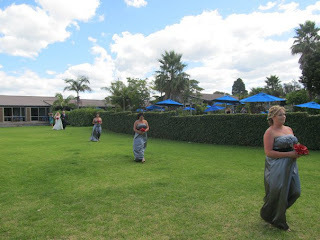 The walk down to the celebrant seemed to take FOREVER but I was fully concentrating on walking as there were a few dips in the grass. 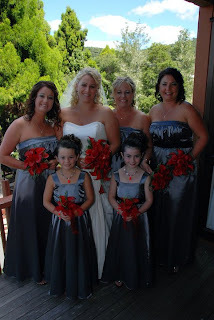 I didn't want to trip and fall over and take all the attention of Rachael, the stunning bride. 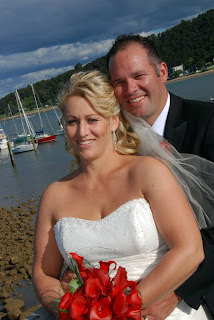 Rachael had had a pretty major operation 3 weeks previous to put rods in her spine and had recovered really well. We weren't sure if she was going to be able to walk properly in time for the wedding but she did an amazing job of healing in time and coped really well - even dancing up a storm after dinner. The day/night was brilliant. Most people stayed at the hotel the following night as well so Saturday included more wine, laughter, and sunshine. It was a really great weekend. I stayed at my friend Swayze's house on Sunday night and then flew back from Whangarei on Monday. Back to shaky Christchurch. On Friday 11th March there was a devastating 9 magnitude earthquake 72km East of the Oshika Peninsular of Tohoku in Japan. Followed by a tsunami which completely wiped out whole towns. As if that wasn't bad enough, 3 nuclear reactors at the Fukushima Nuclear Power Plants suffered explosions due to hydrogen gas that had built up within their outer containment buildings. There was a very high risk of radiation. And just when I didn't think things could be any worse for Japan, I saw a news report and it was snowing. Freezing temperatures for those missing and for the search and rescue teams trying to find them. The last time I checked there were close to 10,000 deaths and up to 14,000 missing. So, so sad. I managed to get in touch with my friend Sayaka in Japan who is safe and well and had been up to stay with her parents who are also safe. What a relief. I was very worried. After having been in an earthquake myself, I now have a better understanding of the ongoing effects after the initial shake. It's the constant aftershocks, loss of power/water/sewerage systems/petrol, the closure or destruction of supermarkets, even the uneven roads and liquefaction that I just never knew about before, but they really take their toll. The things I usually take for granted. I know Japanese are strong people and I hope they can recover from this awful tragedy. Last Friday we had a Memorial Day for people who lost lives in the Feb 22nd Christchurch quake. The service was held in Hagley Park and an estimated 100,000 people filled the park. I didn't attend but Claire, Averil, and Scott went and said it was good. Prince William came to Christchurch for the service and briefly spoke. Many likened him to his Mother, due to his warm and caring nature. He has been quoted as saying that instead of gifts for his April 29th wedding to Kate Middleton, he wants the money donated to the Christchurch Earthquake Fund. What a great guy. I hope he discussed that with Kate first though! Everyone was feeling a little highly strung last weekend due to Ken Ring's earthquake prediction for 20 March. Ken Ring is an Astrologer and author from Auckland who claims he can predict weather for an entire year. He also issues predictions of earthquakes. His prediction for an 8 magnitude quake between Kaikoura and Canterbury on or around March 20th saw lots of people leave Christchurch for the weekend, unable to cope with more devastation. A 5.1 aftershock occurred on March 20th but this was apparently not outside the scientifically expected pattern. No scientists accept Ken Ring's claims or methods. Everyone at Roxburgh Street seems well and happy and working hard. Claire's work is not open yet so they have been working from her boss's house looking after about 10 children a day to try and help the parents who need to get back to work. Hopefully the centre will be checked soon and given the all clear. Averil has been back at Shirley Primary for the past few weeks and things seem as busy as ever for her. Always planning, that girl. Claire sent me a pixt the other night of Averil sitting on the couch with books and work scattered and there was little Min sitting next to her on the couch learning - or so it looked like. Bless. Eru is working long hours out in Riccarton at the Macpac Outlet store and they seem to be doing very well. And Scott is keeping busy at work shoeing horses left, right, and centre. Today is Scott's 32nd birthday so yesterday Claire and I went with him and some friends of his to the Riccarton gallops. It was a good day and we won $148 on the last race. Afterwards we went to a couple of pubs before heading home around midnight. It was a long day but we all had fun. Well, I actually did read this earlier, but have just re-read it and enjoyed it all over again. I hope Christchurch stops shaking by the time I get there in 9 days time!! 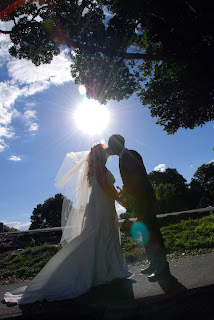 Great update, Editor, and lovely photos of the wedding.